Looks like OnLive is again getting active and releasing new games after many months of inactivity following their ABC bankruptcy and the start of their reorganization. They've recently released the long awaited Witcher 2, and have now added Puddle and Alpha Kimori: Great Doubt - Episode One to the PlayPack. The developer of Alpha Kimori thinks that the new OnLive is much easier to work with and contracts actually get signed pretty quickly, and they intend to bring the second game in the Alpha Kimori trilogy to OnLive. The OnLive PlayPack is now at 244 games in the US, 243 games in the UK and 243 games in Belgium, and counting. Puddle is a physics based indie platform game published by Plug in Digital and developed by Neko Entertainment. In Puddle you have to guide a puddle of fluid by tilting the environment to the left or right! Sometimes you can get the creepy feeling as though said puddle of fluid is sperm and you have to guide it to its destination, wherever that may be. You have to play carefully taking friction, gravity and temperature into account, and by using the unique properties of each type of fluid (water, oil, nitroglycerin, molten lava...) in a range of original environments. You have to conserve as much fluid as possible when crossing a variety of obstacles such as burning passageways, carnivorous plants and electric currents! 2 difficulty modes: normal and extreme. You can subscribe to the PlayPack and play the free demo of Puddle for the US, the UK and Belgium powered by OnLive. Alpha Kimori: Great Doubt - Episode One is an indie JRPG published and developed by Sherman3D. The developer has even created higher resolution maps and customized events exclusively for OnLive. Alpha Kimori: Great Doubt - Episode One is the first of a trilogy of bright and colorful 2D sprite based anime inspired episodic 2D Japanese role playing games, which feature an intricate action-adventure epic story with a delightful mix of sci-fi and fantasy elements. Paying tribute to JRPGs, it utilizes the traditional turn-based battle system and high emphasis is placed on character development. The story is driven by the underlying Great Doubt philosophy which is inspired by the Japanese Zen and Chinese Tao philosophies. The story tells of two opposing forces of Yin and Yang that are dependent on each other and the good and evil sides are a matter of perspective. The story of Alpha Kimori is set 50 years after the alien invasion of Earth when the newly discovered planet Kimori plays host to two warring human factions - the Bidarians, who want to reclaim Earth, and the Jinrians, who are contented with their new home. Even as the Bidarians destroy with their mighty Robotic Intelligent Cybernetic Armor (RICA) technology, the Jinrians defend the planet with the ability to transmute into colossal indigenous creatures. Amidst the turmoil, young Bidarian warrior, Rick, falls in love with Jinrian princess, Yuki. Classic Japanese RPG turn based battles give players time for strategy. Theme song sung by the popular Vocaloid character Hatsune Miku and composed by Yossy. You can subscribe to the PlayPack and play the free demo of Alpha Kimori: Great Doubt - Episode One for the US, the UK and Belgium powered by OnLive. Back on Thursday last week OnLive finally released The Witcher 2: Assassins of Kings Enhanced Edition. 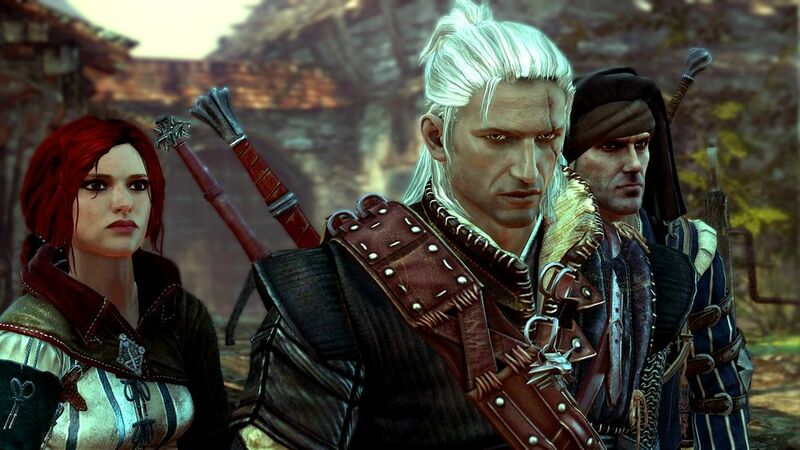 The coming of The Witcher 2 to OnLive has quite a long and interesting story to it. OnLive announced The Witcher 2 as coming soon at E3 2011. Then in August 2011 fierce rival Gaikai added The Witcher 2 to its game demos. Later on even the games' developer CD Projekt RED multiple times reiterated that the game will come to OnLive, but the game didn't come. Finally, after OnLive went through ABC bankruptcy in August 2012, and after reorganization started and founder and CEO Steve Perlman departed, it was reported that Steve shot down any game that Gaikai nabbed first; even titles that the company had already spent money to onboard, test, and certify with a game publisher. The Witcher 2 was one of these games. The Witcher 2 was arguably the most anticipated game by OnLive gamers, so its long and troubling story to release did hurt gamers' love for OnLive. Looks like the game was quite far along to release on OnLive for a long time, but after the unpleasant news of why the game wasn't released, OnLive gamers didn't believe that the game will come at all. The more surprising it is now that OnLive made up with CD Projekt RED and released the game after all. The Witcher 2: Assassins of Kings Enhanced Edition was released as a PlayPass and into the OnLive PlayPack. The game is priced at $19.99 in the US ($13.99 PlayPack discount), £14.99 in the UK (£10.49 PlayPack discount) and €19.99 in Belgium (€13.99 PlayPack discount). The OnLive PlayPack is now at 242 games in the US, 241 games in the UK and 241 games in Belgium, and counting. Gamers who purchase a PlayPass for The Witcher 2: Assassins of Kings Enhanced Edition on OnLive (UK, Belgium), get a free digital download copy from GOG.com with the purchase while supplies last. This is a great option for gamers who fear that they won't be able to enjoy the streaming version of the game from OnLive because they lack the necessary broadband quality. Upon purchase of The Witcher 2: Assassins of Kings Enhanced Edition on the OnLive cloud gaming service, you will receive an email with your product key. Visit www.gog.com/witcher2/backup to input your product key, then click the redeem button. Follow the on screen instructions to login or sign up for a free account. Your download copy will appear in your ‘My Games’ section on GOG.com. The Witcher 2: Assassins of Kings Enhanced Edition is a role-playing game published and developed by CD Projekt RED. Its predecessor, The Witcher: Enhanced Edition Director's Cut, is already a part of the OnLive PlayPack and you can actually import saves from the first Witcher to the second one, as long as you have saves from either “Ice Plains” or the “Order of the Flaming Rose Cloister”. The second installment in the RPG saga about the Witcher, the professional monster slayer Geralt of Rivia, features a thoroughly engrossing, mature storyline defining new standards for thought-provoking, non-linear game narration. In addition to an epic story, the game features an original, brutal combat system that uniquely combines tactical elements with dynamic action. A new, modern game engine, responsible both for beautiful visuals and sophisticated game mechanics puts players in the most lively and believable world ever created in an RPG game. A captivating story, dynamic combat system, beautiful graphics, and everything else that made the original Witcher such a great game are now executed in a much more advanced and sophisticated way. It's a truly epic, intense, emotionally charged adventure with non-linear game narration. Three independent plot lines with several alternative events are dependent on the player's choices and lead to multiple different game endings and several additional plot forks. This time gameplay time is shorter than The Witcher 1, but more intense and packed with events. This is an unique, deep, consistent and rich game world established in a series of best-selling books by Andrzej Sapkowski and recreated in the game to provide an incredible, believable story-driven experience. You can play the free demo, subscribe to the PlayPack and buy The Witcher 2: Assassins of Kings Enhanced Edition for the US, the UK and Belgium powered by OnLive. At a press conference last week Sony unveiled the PlayStation 4, though how the console looks wasn't revealed as Sony wants to keep some secrets for the upcoming E3 in June. Especially the inclusion of 8 GB of GDDR5 RAM was a surprise. Sony also did held back with game reveals for the PS4, apart from some tech demos the high points were Killzone: Shadow Fall and Watch Dogs. Sony's cloud gaming plans for the PS4 are a bit more nebulous, which isn't surprising considering that they are cash strapped and it would be a huge risk for them betting full on cloud gaming and providing such a service to tens of millions of gamers. David Perry, the CEO of cloud gaming company Gaikai which was purchased by Sony for $380 million, was prominently featured at Sony's press conference and shared Sony's long-term vision that they intend to offer backwards compatibility for PS3, PS2 and PS1 titles via the cloud. No cloud gaming plans for native PS4 games were mentioned. Considering that it currently isn't cost effective to emulate PS3 games on PC hardware running in cloud gaming data centers, it's no wonder that Sony is being hesitant to announce any definite cloud gaming plans in the short-term. The Cell chip powering the PS3 can now be produced very cost efficiently, but that doesn't help Sony as the chip isn't suitable for cloud gaming installations because the games have to run with higher frame rates on cloud gaming servers to make up for the latency deficit via the internet and the Cell chip also isn't built with latency in mind and lacks fast and efficient video encoding hardware. Emulating PS2 and PS1 games on PC hardware running in cloud gaming data centers could be something that would be easily achievable as it's fairly easy and cheap to do on current PC hardware. But doing it for tens of millions of PS4 gamers, and gamers on other devices, can't be cheap or easy. 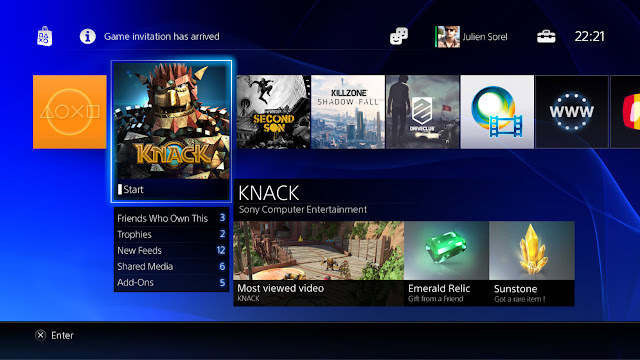 As opposed to cloud streaming, the plans for digital downloads and leveraging the cloud for gamer connectivity, are pretty much well defined by Sony. They did take a few pages from OnLive's book by stating that they intend to offer subscription packages in the vein of the OnLive PlayPack for games, be it the latest PS4 games or older PS3, PS2 and PS1 games. Gamers will be able to buy every PS4 game via digital download, though retail copies of games will also be sold and won't require an internet connection. 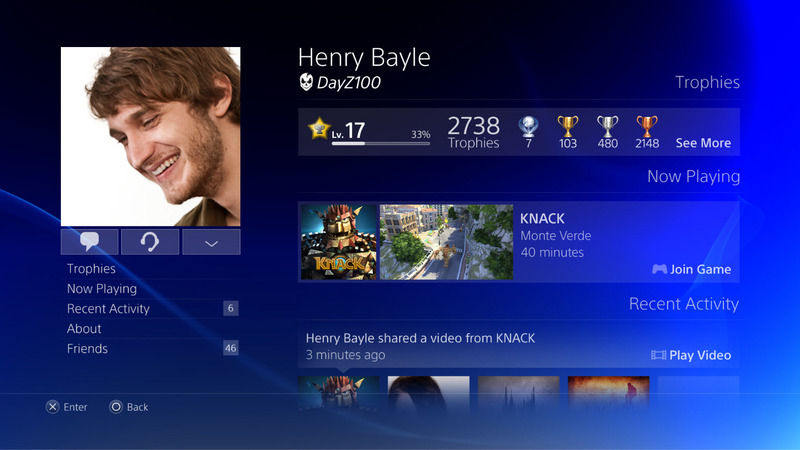 Sony also wants to provide free time limited demos for all PS4 games, which is also something that the OnLive cloud gaming service championed. It's not exactly clear if they want to provide said free demos via cloud streaming or via digital downloads. But at least in the short-term I think that it's nearly a given that they will leverage Gaikai's downloader technology for the free demos. It looks like at least in the short-term Sony will heavily rely on Gaikai's downloader tech that Sony got with Gaikai's cloud gaming package. The downloader tech uses Gaikai's non-linear progressive download cloud delivery technology which in layman's terms means that depending on their internet speed, gamers will be able to play PS4 games in mere minutes as the downloader first downloads the parts of the games that are needed to start the game and installing the rest of the game while the game is already being played. Since games can be started in minutes this is very usable for gamers to try the games for free before they purchase them. Gaikai took even more pages out of OnLive's book by including a share button on the new PS4 controller, the functionality of which resembles the record button on the Universal OnLive Wireless Controller. 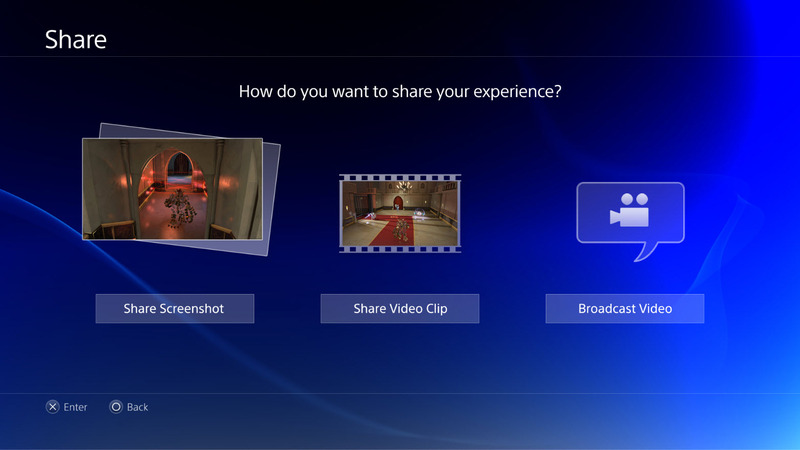 With the share button PS4 gamers will be able to share a livestream of their gameplay via USTREAM that Sony partnered with and invite others to watch the livestream via the PS4, Facebook or on various devices like mobiles. Since the PS4 has hardware that continuously records the last minutes of gameplay the button can also be used for sharing gameplay recordings and pictures similar to OnLive's Brag Clip functionality, again sharing the gameplay recordings and pictures with other people with the PS4, Facebook or on other devices like mobiles. Of course people will be able to chat while spectating or watching gameplay recordings and pictures. 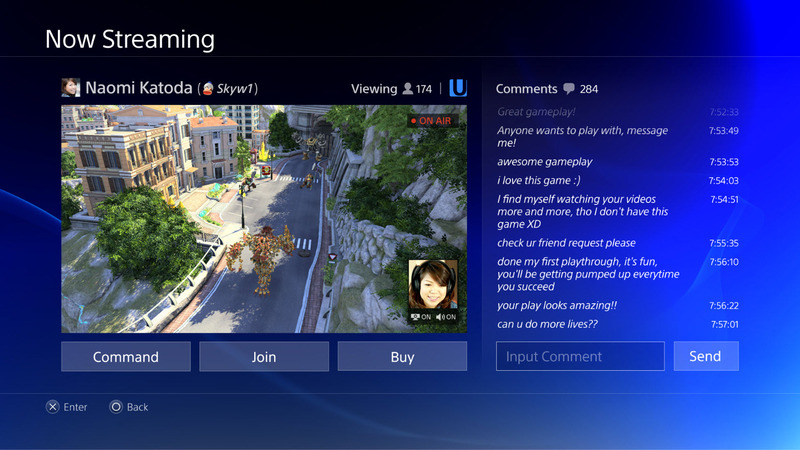 It doesn't look like the PS4 can yet mimic the massive live spectating OnLive Arena which is no wonder if they don't feature cloud streaming yet, but Sony is definitely going for the social gamer crowd. The PS4 has efficient and fast video encoding and decoding hardware. With the help of that hardware the PS4 will leverage at least some of the Gaikai cloud streaming know-how in the short-term by providing remote play options for the PS Vita and other devices like tablets, smartphones and even Smart TVs, that way every PS4 will be able to function as a cloud gaming server. This will work similar to NVIDIA's upcoming Project SHIELD gamepad. Looks like Gaikai's David Perry copied quite a few things from their former fierce competitor OnLive. I already reported that OnLive founder and former CEO Steve Perlman was not exactly friendly with David Perry. One could imagine that when Steve saw David's presentation at the Sony press conference he wasn't amused to put it mildly, though who knows if this really interests him anymore as he is a man in pursuit of the next big invention and technological breakthrough like for instance the DIDO wireless technology.